The second volume covers solvent control, ultrafast electron transfer and coherence effects, molecular electronics, electron transfer and chemistry, and biomolecules. Electron transfer science has seen tremendous progress in recent years. Technological innovations, most notably the advent of femtosecond lasers, now permit the real-time investigation of intramolecular and intermolecular electron transfer processes on a time scale of nuclear motion. New scientific information abounds, illuminating the processes of energy acquisition, storage, and disposal in large molecules, clusters, condensed phase, and biophysical systems. 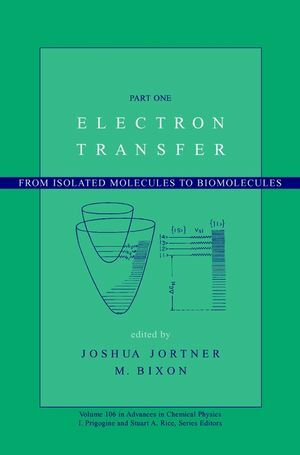 Electron Transfer: From Isolated Molecules to Biomolecules is the first book devoted to the exciting work being done in nonradiative electron transfer dynamics today. This two-part edited volume emphasizes the interdisciplinary nature of the field, bringing together the contributions of pioneers in chemistry, physics, and biology. Both theoretical and experimental topics are featured. The authors describe modern approaches to the exploration of different systems, including supersonic beam techniques, femtosecond laser spectroscopy, chemical syntheses, and methods in genetic and chemical engineering. They examine applications in such areas as supersonic jets, solvents, electrodes, semi- conductors, respiratory and enzymatic protein systems, photosynthesis, and more. They also relate electron transfer and radiationless transitions theory to pertinent physical phenomena, and provide a conceptual framework for the different processes. Complete with over two hundred illustrations, Part One reviews developments in the field since its inception fifty years ago, and discusses electron transfer phenomena in both isolated molecules and in clusters. It outlines the general theory, exploring areas of the control of kinetics, structure-function relationships, fluctuations, coherence, and coupling to solvents with complex spectral density in different types of electron transfer processes. Timely, comprehensive, and authoritative, Electron Transfer: From Isolated Molecules to Biomolecules is an essential resource for physical chemists, molecular physicists, and researchers working in nonradiative dynamics today. JOSHUA JORTNER is Heinemann Professor of Chemistry at Tel Aviv University's School of Chemistry, where he has been on the faculty since 1964. Professor Jortner is President of the International Union of Pure and Applied Chemistry, former President of the Israel National Academy of Sciences and Humanities, and the recipient of the Wolf Prize in Chemistry (1988). M. BIXON is Chemistry Professor at Tel Aviv University's School of Chemistry, where he has been on the faculty since 1966. He holds a PhD from the Weizmann Institute of Science in Rehovot, Israel. Electron Transfer Past and Future (R. Marcus). Electron Transfer Reactions in Solution: A Historical Perspective (N. Sutin). Electron Transfer-From Isolated Molecules to Biomolecules (M. Bixon & J. Jortner). Charge Transfer in Bichromophoric Molecules in the Gas Phase (D. Levy). Long-Range Charge Separation in Solvent-Free Donor-Bridge-Acceptor Systems (B. Wegewijs & J. Verhoeven). Electron Transfer and Charge Separation in Clusters (C. Dessent, et al.). Control of Electron Transfer Kinetics: Models for Medium Reorganization and Donor-Acceptor Coupling (M. Newton). Theories of Structure-Function Relationships for Bridge-Mediated Electron Transfer Reactions (S. Skourtis & D. Beratan). Fluctuations and Coherence in Long-Range and Multicenter Electron Transfer (G. Iversen, et al.). Lanczos Algorithm for Electron Transfer Rates in Solvents with Complex Spectral Densities (A. Okada, et al.). Spectroscopic Determination of Electron Transfer Barriers and Rate Constants (K. Omberg, et al.). Photoinduced Electron Transfer Within Donor-Spacer-Acceptor Molecular Assemblies Studied by Time-Resolved Microwave Conductivity (J. Warman, et al.). From Close Contact to Long-Range Intramolecular Electron Transfer (J. Verhoeven). Photoinduced Electron Transfers Through Bonds in Solution (N.-C. Yang, et al. ).